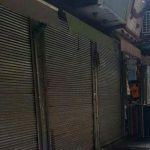 On Monday, May 14th, merchants in Tehran bazaar closed their shutters in protest at the destructive economic policy and prohibitive customs tariffs imposed by the clerical regime. 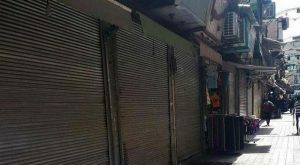 Popular stalls, including the Kuwaiti bazaar, Sadaf Passage, and Aladdin Passage, were closed after marketers called for a day of strikes. The move comes in the face of increased repression towards protestors. Intelligence agents of the clerical regime made ominous threats against any vendors who would shutter their stalls in solidarity with the opposition. Tehran’s merchant strike comes as the merchant strike in Baneh enters its fourth week. There, the authorities have responded with repressive measures. Merchants striking are being arrested and running the risk of losing their livelihoods. The reality of the situation is that the vendors have no choice. The Iranian regime closed border crossings at Baneh, Marivan, Piranhasar and Sardasht. This has reduced local employment options, causing a sharp rise in unemployment. This means people are not shopping as much as they used to. The economy is stagnating, and shop owners are seeing their profits erased. This economic stagnation is compounded by the mullahs’ decision to increase customs tariffs in April. What meagre profits merchants were able to scrape together are now being devoured by the mullahs in the form of tariffs, leaving the people with no choice but to go on strike. The regime will undoubtedly employ the same tactics of terror and repression it is using in Baneh, against the merchants in Tehran. Plain clothes agents and guards are already roaming around the bazaar, positions at important intersections including Imam Hossein Square, Ferdowsi Avenue and Molawi. The Iranian resistance, the NCRI and the People’s Mujahedin of Iran (MEK) stand with the merchants. The organisations, called on the public, especially the youth, to support and express solidarity with the protests of merchants in Tehran and other cities.